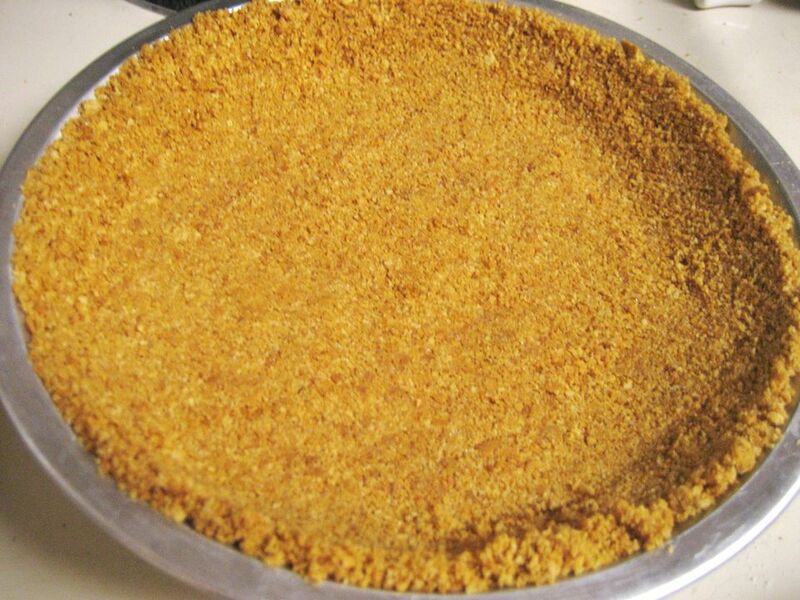 This simple vegan graham cracker pie crust can be used for a variety of recipes. Your graham cracker crust can be the base of everything from a breakfast quiche just as easily as it can line an elegant cheesecake, a homemade pumpkin pie or any kind of pie or any vegan dessert you can possibly imagine. Graham cracker crusts are a classic and popular choice, and, once you get a hang of how to make them, the variations are endless: there's chocolate graham crackers, cinnamon graham crackers, and, if you're British or from the UK, there's always digestive biscuits just waiting to be made into a simple pie crust as well. These days, you can also buy the graham crackers already in crumb form already ready to go, but for me personally, that takes some of the fun out of making them homemade, and, let's face it, this is already a super easy and "semi-homemade" way to prepare a pie crust. This easy graham cracker pie crust recipe uses just three simple ingredients and is also vegan if you use vegan margarine instead of butter. If you want to try a sugar-free variation, here's how to make a sugar-free graham cracker crust. Recipe note: Once you've made a graham cracker pie a few times, branch out with different kinds of crackers and cookies. Use Oreo cookies (or Trader Joe's brand sandwich cookies) for a homemade chocolate cookie crust, or try using store-bought gingersnaps for things like pumpkin pie, sweet potato pie or anything with a touch of cinnamon or fall spices. Peanut butter sandwich cookies (such as Nutter Butters) also make an interesting choice, depending on what kind of pie you are making. Get creative and have fun! Hint: You can also do something similar with granola. Here's how to make a granola pie crust. Pour the crumbs into a bowl and add the sugar and melted vegan margarine. Stir well. Pour the mix into a pie pan and use your hands or the back of a large spoon to press the mixture into the bottom and sides of the pie pan. If you need to pre-bake the pie crust, bake for 8 minutes at 375 F. Otherwise, chill the crust before using.